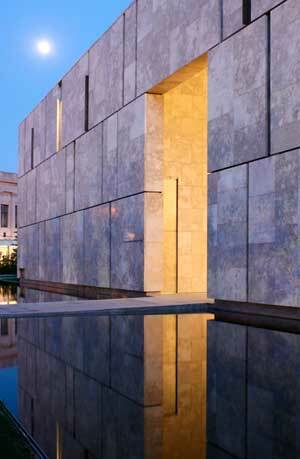 After years of controversy and lawsuits, and then a judge’s ruling in 2004 that allowed the Barnes Foundation to move out of Merion, Pennsylvania, and into the heart of Philadelphia, the new home of one of the world’s finest museums finally opened on the Benjamin Franklin Parkway last May. The effect of the new building and landscape on Philadelphia is significant. The new 4.5-acre museum seems to raise the quality of the parkway and the city’s cultural offerings almost single-handedly. 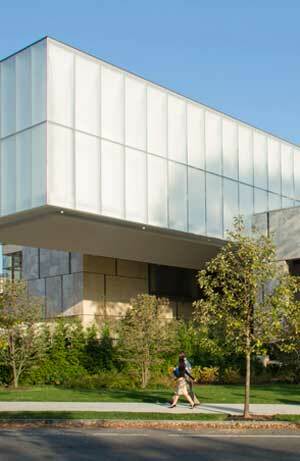 While the museum building by Todd Williams and Billie Tsien has rightfully received almost universal rave reviews, the landscape architecture got short rift in the major press (as always), perhaps with the exception of the The Philadelphia Inquirer‘s coverage. 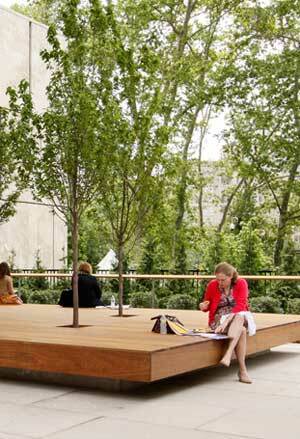 Their loss: the story about the new landscape architecture by Philadelphia-base landscape architecture firm OLIN is about as fascinating as the story about the new building. Now, the way in. One of the nicest features of the new landscape architecture is the entryway, which feels like a small, contemporary piece of Europe just landed in Philly. 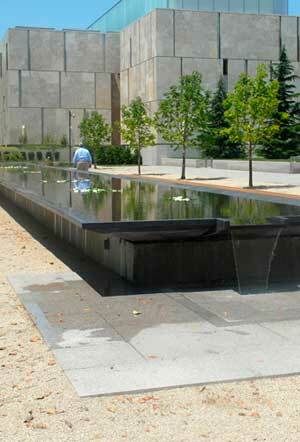 As you walk off the parkway, you are greeted by a unique black granite fountain, sleek and contemporary, offset by benches. Past this fountain terrace, you move either towards a small pavilion, which provides a coat check and service entrance, or meander along a path over a river bedded with rocks to the actual doorway. The door itself is almost hidden, with the sign for the museum at hip level. 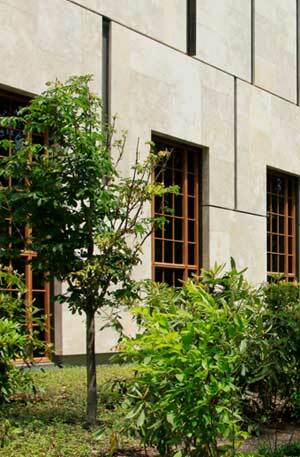 Within this entry zone are small trees, with plinths as a backdrop hiding the parking lot beyond. All of this was accomplished while also creating a highly sustainable LEED Platinum museum and landscape. The building roofs either have skylights to let in light, solar panels to create energy, or green roofs filled sedum to catch rainwater and insulate the buildings. 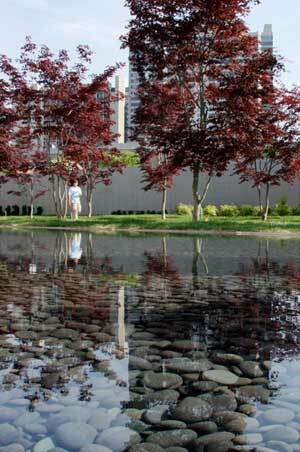 Around the buildings is a landscape purposefully designed to capture stormwater. Any excess water is steered towards a cistern, which captures stormwater for later irrigation on the site. “Water is directed through planted areas and granular materials to aid in filtering and cleaning it.” And even within the building, there’s a new interior courtyard filled with trees and enclosed in glass. While not accessible to people, the green space provides a glimpse of nature, a brief respite from room after room of art. Even during a tour of the museum in January, the courtyard was bright, refreshing. There’s also a sheltered outdoor space next to the museum cafe, which is easy to imagine as a swanky event space on a summer night. 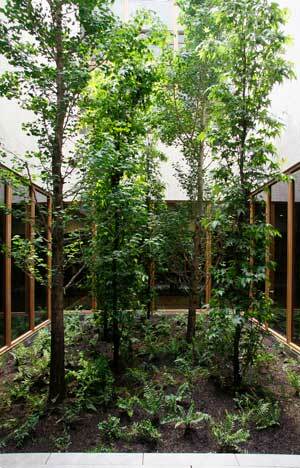 The space is enlivened by a trio of trees set within a wooden bench and other plantings. Upon leaving, one of the memorable experiences is actually walking all the way around the building, and seeing how all the new grading, series of trees, and street designs come together for pedestrians. The connection to OLIN’s Rodin museum landscape is especially welcoming, as there seem to be multiple paths leading from the edge of the Barnes into Rodin if that museum’s gates are open. Towards the south, Logan Circle has also been revitalized. The new Sister Cities park by Studio Bryan Hayes with its fun watery playground and a green roof-covered angular pavilion by Digsau bring a burst of contemporary design to the fairway. The new pavilion with its much-needed cafe is great right next to an old church. The revitalized fairway then is Philly at its best. 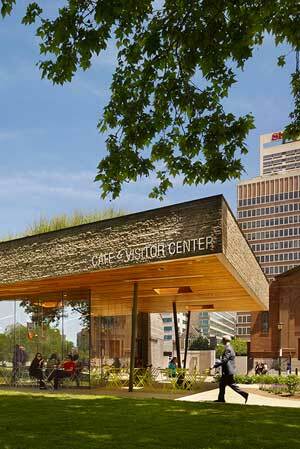 The streetscape seems to have gotten as much attention as the new museum and its landscape. 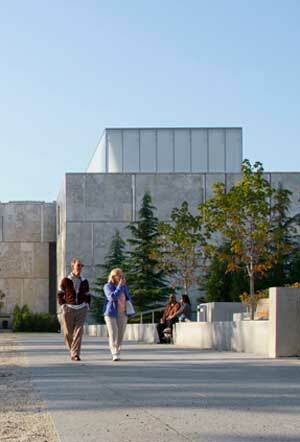 Next time you visit, walk from the new Sister Cities Park to the new Barnes Foundation, through it and then around it, and then have a coffee before heading to the Rodin Museum, the Philadelphia Museum of Art, and Fairmount Park. You may find that you just end up doing this anyway. This what you’ve been asked to do — through the design. Looks fabulous! I plan to go soon.